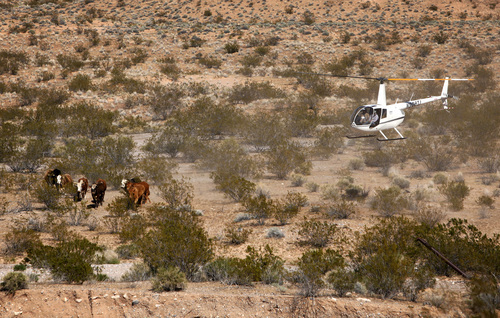 Cliven Bundy and his ragtag band of armed supporters forced the federal government to back down as the roundup of Bundy cattle was called off and the bovines returned to the Nevada rancher. Some declared victory and hailed the outcome a clear blow against tyranny and a win for freedom. Hardly. The only winner in this was a scofflaw who has twice lost in the courts for running cattle where they don&apos;t belong and skipping out on grazing fees. Some 20,000 ranchers in Western states abide by BLM regulations, so what makes Bundy special? What makes Bundy special is the army of self-styled patriots who rallied to his ranch with their guns and grudges. If the government hadn&apos;t acted to defuse the situation by backing off and letting Bundy have his win, we might have witnessed Americans shooting Americans over a few cows and a specious interpretation of the Second Amendment and private property rights. Emboldened by their apparent victory, the fringe is gearing up to employ the same tactics elsewhere, convinced their gun-toting intimidation is what the Founding Fathers intended. Unfortunately for the rest of us, the sum total of their understanding of the Constitution fits on an NRA bumper sticker. The Constitution is actually very clear on the government&apos;s obligation to enforce the law, as well as its explicit duty to put down insurrection. The Tea Party history of America skips right over 1794, when George Washington raised an army and marched on people who threatened government officials and refused to pay taxes. The "Whiskey Rebellion" fizzled at the show of federal force. Thanks to President Washington&apos;s decisiveness, the Constitutional United States of America under the new Constitution succeeded where the Articles of Confederation, with its emphasis on states rights and powerless central government, had failed. No one voted for the armed rabble camped in Bundy&apos;s yard. When some manage to avoid justice by extralegal means, the rule of law is weakened for all Americans. The victory on Bundy&apos;s ranch, backed as it was by the threat of violence, is a danger to the peaceful functioning of a civil society. Swagger and bombast shouldn&apos;t become the American way. The government was right to back down to avoid possible bloodshed, but it should employ other means to see that Bundy doesn&apos;t profit from his lawlessness.